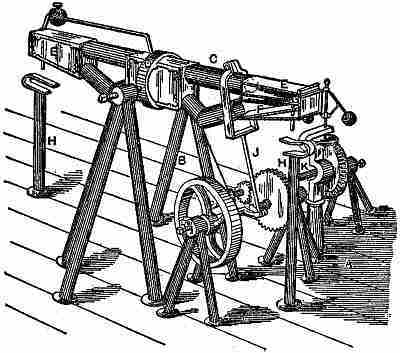 A beam, C, pivoted on a center at D, and connected by a pitman, J, to a crank and fly wheel, contains a long straight tube at the top and two double inclined tubes below. A ball rolls along the upper tube by gravity in synchronism with the revolving wheel and axle, so that its momentum just carries it to the drop valve and incline at F as the crank reaches the upper point of its revolution. The steeper incline of the lower double bend tube returns the ball to the farther end of the tube in time to start in the straight tube for its next run. Patented in 1870.